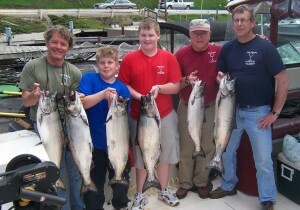 May 5, 2004..., Jackson and his crew with part of a limit of early spring kings. As we backed my charter boat into the narrow slip at Oswego Marina, my buddy Bob, standing on the dock, asked 12-year old “Jackson” Davis, “How”d they bite, young man?” Jackson couldn’t wait to spit the words out, “We limited out!” “Aha, said Bob, the browns are a lot of fun this time of year, aren’t they?” “We didn’t catch any browns”, Jackson blurted out, we caught king salmon”. Jackson flipped open the big cooler, heaping with 8 to 19 pound mint-silver kings. The date was May 2, 2005, and we could not have had a better day of fishing. I had located the fish the day before, figured out a pattern, and “Jackson”, his Dad, and Bob Jones had cashed in. The seas were calm and the skies sunny, but the best part…, we were the only boat on eastern Lake Ontario fishing kings that morning. 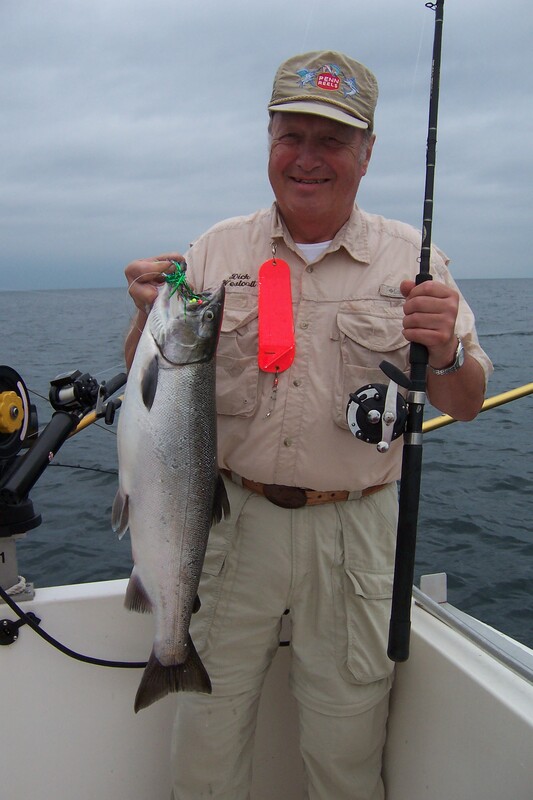 Since 2004, spring fishing for king salmon, just 5 minutes outside Oswego Harbor, has been fantastic. In 2004, 2005 and 2006, just in the monthof May, anglers aboard my charter boat boated more than 400 king salmon and 150 cohos, this in an area much better known for spring brown trout fishing. 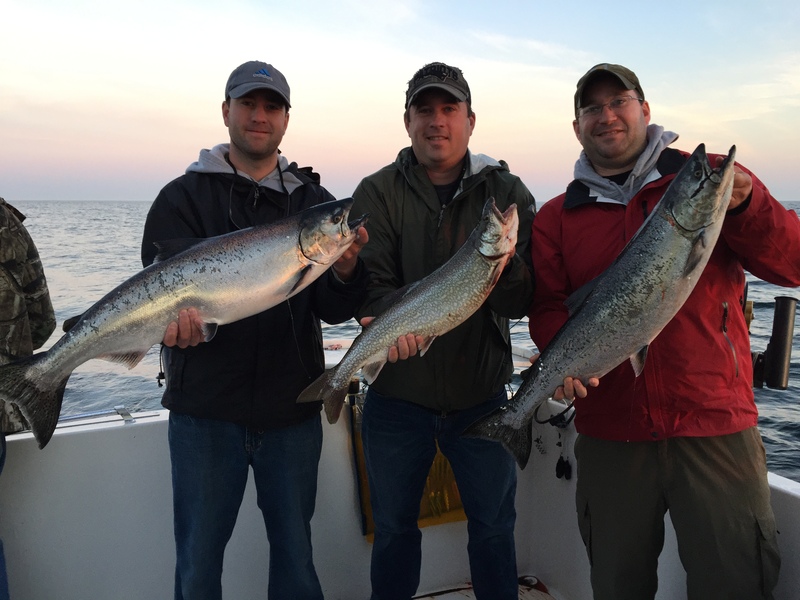 Fishing for king salmon continues on through June and July as these sleek predators stay just offshore while hordes of alewives move shallow to spawn. Experience has shown that high spring flow in the Oswego River is a major attraction for baitfish and spring kings and cohos. Since 2001, another great year for spring kings, the pattern seems clear, high flows produce hot spring salmon fishing. Some springs, as snow melts and runoff peaks flow in the Oswego River reaches up to 25,000 cfs. Laden with nutrients from thousands of acres of rich farmland in the 5,000 square mile watershed, the huge greenish colored plume of water off Oswego Harbor is like an oasis in the Sahara to fish in eastern Lake Ontario. With such a mild winter so far in 2015-16, and so little snow pack in central New York, flow in the Oswego River might be lower than normal, but a lot can happen between now and spring. If you’re thinking about sampling the super spring king fishing at Oswego, on a typical sunny day the early bird definitely gets the worm. Leaving the dock at Oswego Marina at 5:00 AM, it’s only a short 5-minute ride to the fishing grounds in 90 to 100 feet of water. Most mornings my rods are in the water just before daybreak. At that time, almost no fish or bait can be seen on my Garmin fish finder below 30 feet. Some calm mornings, salmon can be seen porpoising right on the surface…, exciting. All the early morning action is in the top 30 feet of water, and I mean action. Triples and quads are not unusual. One morning, my crew of three ranging from 79 to 85 years old, including one “young” lady angler, hooked and landed six kings at once from 13 – 19 lbs. Whew! Even though the surface water temperature in early May is 39-40 degrees, on sunny days, kings start to move deep by 7:00 – 9:00 AM and are often flat on bottom in 120 feet of water by late morning. ProChip Flashers and dodgers trailed by Howie Flies are standard fare for spring kings. Spoons like Maulers, Northern Kings, and Michigan Stingers are also excellent spring king medicine. Downriggers, Dipsey Divers, and copper line fished from planer boards get lures down to kings. My personal favorite in May is a white ProChip 8 trailed by a Little Boy Blue Howie Fly. Mauler spoons in either Black Venom or Blue Dolphin patterns are also deadly fished clean on a downrigger. If you’re waiting until August to fish for king salmon in eastern Lake Ontario, you might want to rethink your plan, especially this year. Oh, and the other thing…, there is no better eating fish in fresh water than a spring king salmon dripping with oil after chowing down on alewives all winter…, yum, yum! A midmorning trio of kings caught with only the center rigger in the water. I sent the center rigger down the 5th time to 135 feet Conditions had not changed in several days and I new the troll, due north at a surface speed of 2.7 mph. Wham!! Dr. Kerry Brown, Capt. Tim Hummel, and their first mates, Tom and John watched the 7’ Shortstick double to the water as I tightened the line to the release. The tally was 5 kings in a row on the double pearl dodger and “king salmon” Howie Fly behind the decoy rigger weight down the center, before we could put another line in the water. What Dave had not seen, was what was comng next. Instead of dropping the center rigger back down to 135’, I rigged the two corner riggers with dodgers and flies and dropped them to 130’ and 120’. No takers! I immediately dropped our hot item on the center rigger back down to 135’. We watched intently. We were still on the same hot troll…, identical speed, identical direction, doing everything to “repeat-a-fish”. The sonar was still showing bait and kings from 100’ to 140’. Nothing. After setting copper lines, wire Dipsys, and a thumper rod, we started catching fish again, but not on the riggers. One week later, the scenario was similar. As my crew approached the end of an 8-hour charter, we had boated some nice kings, but not a single one of them had come on a rigger rod. Running three to four riggers at a time, the flashers and Howie Flies, had not produced a nibble. Because our copper rods, wire Dipsys, and thumper rods were all firing I had not changed the rigger spread. As we got ready to haul lines, I purposely pulled both boom riggers and spread the corner riggers, one down 100’, one down 140’. Before I could get the second boom rigger weight out of the water, we doubled on the two green ProChips trailing green krinkle flies. Reducing the number of riggers in the water and spreading them out was all it took. I don’t know about you, but I’m a firm believer in the addage that, “less is often more”when it comes to fishing riggers. And, when I say less, think about not just dropping down to two riggers, but sometimes only one! One fish on one rod every 10 minutes equals 6 fish/hour, equals… You know! We watched my 16” flat screen in amazement as not one, but four cohos darted around behind the red #00 dodger and little green hummer Fish Doctor fly trailing 5’ behind my underwater camera on the center rigger set 15’ below the surface. As all four fish swirled around in full view of the camera, one of the silvery torpedos shot forward and nailed the fly, pulling the line from the release. The 7’ Shortstick sprang upward and a quick hand snatched the ultralight rod from the rod holder. Before the excited angler could say, “Fish on!”, the mint silver coho was already airborne. Coho salmon are an early spring bonus in inshore waters of Lake Ontario, and are often in the same water around Oswego Harbor as brown trout. Nothing compares to their wild and wooly antics when hooked close to the boat. Absolutely fearless of boats, and very surface oriented, I’ve seen them hit lures many times that were in full view, less than 6’ behind a down rigger weight and not more than one foot below the surface. The wilder and noisier the action of a lure and the gaudier the color, the more cohos like it. As they say, cohos like any colored lure as long as it has fluorescent red or orange in it. When you find a “wolf pack” of marauding spring cohos, prepare for action, because it’s not unusual for every single rod you have in the water to double over with a fish on it. Cohos are hyper fish. Everything they do is fast including the rate at which they grow. The cohos that make up Lake Ontario’s spring fishery are 2-year old fish that weigh 3-5 lbs. By late August of the same year, when they stage before returning to the hatchery in the headwaters of the Big Salmon river in northern Oswego Co., they will weigh 6-12 lbs. and more. After spawning, adult cohos will die like all Pacific salmon. Unlike Chinook salmon that migrate back to the lake from spawning streams as 3-5 month old spring fingerlings, young cohos remain in spawning streams in rearing areas for more than a year. To mimic this behavior, the New York State Dept. of Environmental Conservation stocks 3”-4” chinook salmon at the spring fingerling stage and 5”-7” cohos at the yearling stage. One of the favorite rigs for spring cohos is a fluorescent red #00 dodger trailed 12” – 14” back by a small 1” – 2 ½” green mylar coho fly, which I tie myself. The smaller dodgers are effective trolled shallow on downriggers and Dipsy divers. The icing on the cake for any spring coho spread is a set of #00 dodgers and coho flies behind inline planer boards like the Church TX-12 Mini Planer(www.churchtackle.com) off each side of the boat. .
Fifteen minutes earlier, 100 feet below us, a big king salmon had inhaled a whole alewife rigged behind an 11” ProChip flasher. The rigger rod doubled over, drag screaming on the levelwind reel in John’s hands. The 25 lb. king thrashing in the net on the deck was a beauty. John’s comment surprised me. He didn’t say “Wow, what a beautiful fish!” or “Man what a heck of a fight!”, but, “Holy smokes! That’s the smoothest reel I’ve ever used!” My sentiments exactly about Abu Garcia’s 7000i Synchro. Each season on Lake Ontario I fish about 150 charter trips, and put my equipment to the test. When I find gear that really performs day after day, I like to share that information with fellow anglers. This past season, one piece of equipment stood out, Abu Garcia’s 7000i Synchro, one of the slickest levelwind line counter reels you will ever fish. The 7000i Synchro, holds 250 yards of 20 lb. test monofilament line or 1000 feet of 30# test twisted stainless wire plus mono backing. 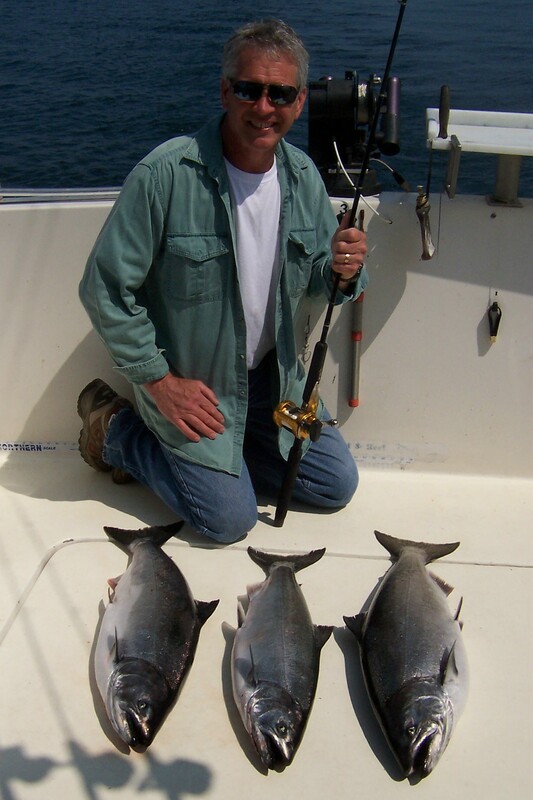 I have fished the 7000i line counter four charter fishing seasons, roughly 150 charter trips per season, for salmon and trout without only minor issues including eventual wear of the level wind and slight loosening of the reel handle. Most anglers would not put this many hours on a reel in their entire lifetime. Since I started trolling for trout and salmon with wire line back in the a1960’s, then leadcore line, Dipsy Divers, planer boards, and downriggers I use today, I’ve fished most brands of levelwind reels on the market, but none has performed better than the Abu Garcia 7000 Synchro I fished for the first time during the 2011 Lake Ontario season. After fishing it almost 650 trips since then, including two months of the 2015 season, the one word that comes to mind is…, NICE! The 7000 has always been a great reel, popular with Great Lakes charter captains especially. But, now Abu Garcia has taken this classic trout and salmon reel several steps further. The Carbon Matrix drag is silk smooth. Three ball bearings give it a Teflon feel. The rubber textured reel handle knob is super comfortable, but the handiest feature on a busy charter boat is the Synchro drag system. Every angler who trolls big water, whether for trout, salmon, walleyes or muskies will appreciate the Synchro drag system, especially if you fish deep with downriggers or Dipsy Divers. No more flipping the free spool lever and thumbing a reel or changing the setting on the star or lever drag as you lower your downrigger into the depths. No more wearing the skin off your thumb as you drop a Dipsy back on wire. With the 7000i Synchro, if you want to drop a rigger or let out a Dipsy, you never have to take your hand off the reel handle or change the drag setting. All you do is crank the reel handle backward a ¼ turn and the drag automatically loosens up slightly, maintaining enough tension to keep a bend in a downrigger rod as a rigger weight drops or allow a Dipsy to drop back slowly. 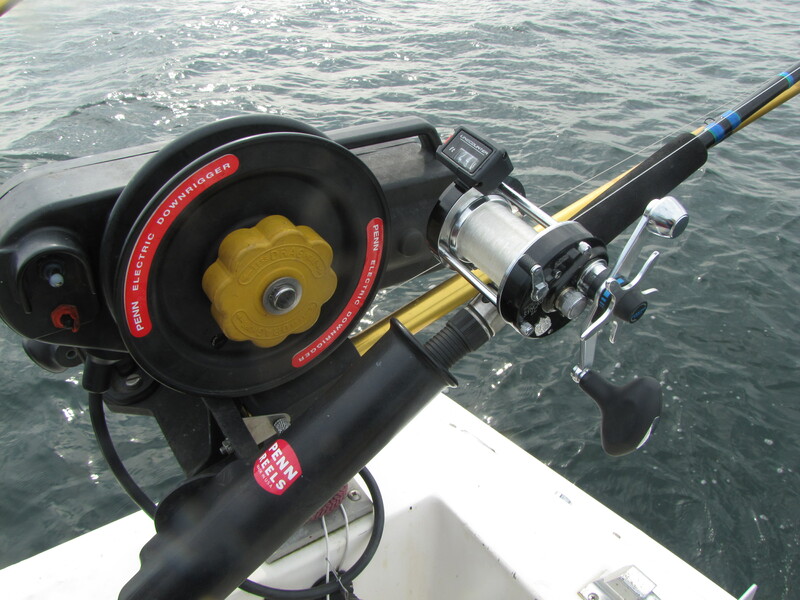 With 150 charter trips under my belt per season, I really appreciate the Synchro feature of the 7000 LC reel and everything else about it for Lake Ontario trolling. What a time saver this drag system is! Now, when I’m dropping a rigger to 140 feet for lakers, which takes a while, I no longer have to “stand at attention” with a reel in free spool and thumb the spool until the rigger reaches the right depth. All I do is crank the 7000i’s handle back a ¼ of a turn, walk away, listen for the beep on my Penn rigger signaling the rigger has stopped 140’ down, return to the rigger and crank the Synchro handle forward ¼ of a turn to the original drag setting and I’m good to go. Meanwhile, I can be netting fish, setting another rod or taking a quick sip of coffee. Performing flawlessly four more than four seasons, all I can say is…, What a reel!!! . My Fish Doctor anglers really enjoy using it, and land more fish with it because of the silk smooth drag and comfortable rubber tension reel handle knob that isn’t as tiring as a slipper plastic knob. Very nice reel! Since I started trolling for trout and salmon with wire line back in the a1960’s, then the leadcore line, Dipsy Divers, planer boards, and downriggers I use today, I’ve fished most brands of levelwind reels on the market, but none has performed as well than the Abu Garcia 7000 Synchro I fished for the first time during the 2011 Lake Ontario season. Mike, Dave, and Nate Inginger with a king salmon triple they boated in early morning on 5/28/15. Whether it’s precisely casting a dry fly to a rising brown trout in a crystal clear stream or centering a rocketing grouse in a pattern of 6’s as it thunders away thru a jungle of aspens, timing is everything. 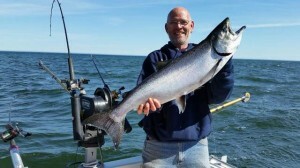 So too, is timing the secret to a successful king salmon fishing trip on Lake Ontario. Misconceptions about the best time to fish for kings in eastern Lake Ontario plague anglers and result in disappointing trips. Many years ago, back in the late 70’s when I first started fishing eastern Lake Ontario, king salmon were few in number and only available to boat fishermen when adult spawners moved into the southeast corner of Lake Ontario in August and September to stage in Mexico Bay off the mouth of the Salmon River where the first king salmon stockings were made in 1971. Ever since, the notion persists that the best king salmon fishing is still in August and September. Each year I even receive calls from anglers asking to book lake salmon fishing charters in October, long after adult kings have entered spawning streams. 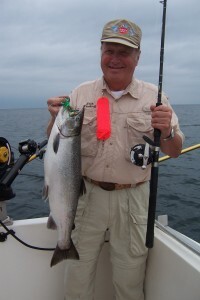 The fact is, in the Oswego area of Lake Ontario king salmon are available through most of the lake charter fishing season from early May to mid to late September, depending on conditions. Some of the best, most consistent king salmon fishing occurs long before August in some of the nicest weather of the lake fishing season, when mint silver kings are aggressively feeding, and much better eating than when they start coloring up in late August. A few years ago, in the month of May, in 31 charter fishing trips, Fish Doctor anglers boated 201 adult kings in 31 trips. Last season, 2015, the hottest salmon fishing of the season was from late April thru May and again from July 10 to to August 8. When George and Kevin Robinson and their two buds fished aboard the Fish Doctor on May 30, they boated 10 adult kings, our best catch in May, with no other boats nearby. 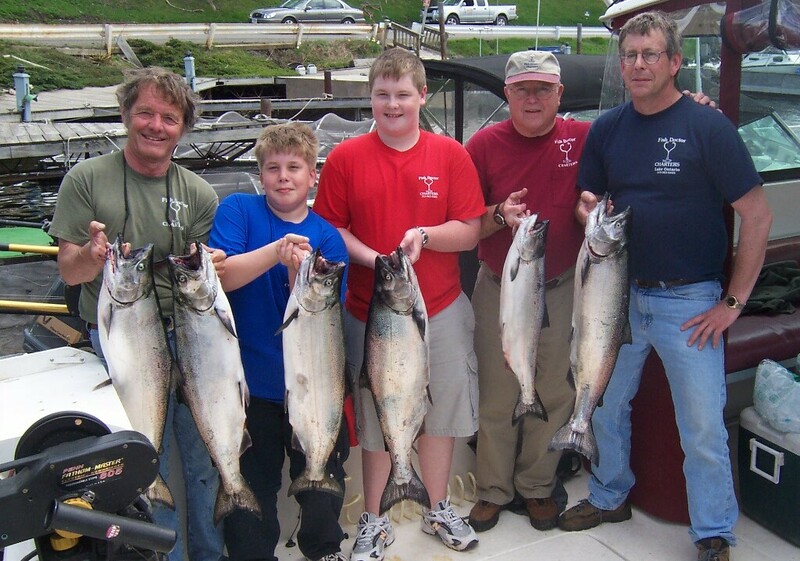 Later on July, our best trip that month, Joe Winot and his family boated 15 kings on a beautiful, calm, sunny day. Compared to later in August and September, there is lots of elbow room on the water in May and July. In May, if river flows are high, the warm, nutrient laden water of the Oswego River, is like a magnet to baitfish and the trout and salmon which feed on them. King and coho salmon stack up in the plume of the Oswego River where it extends out into the lake in 70 to 120 feet of water, providing fast spring salmon fishing. The peak alewife spawn, when the bulk of the adult Lake Ontario alewives are inshore spawning in shallow water occurs each year around midJune. As these baitfish begin to move back offshore in early July after spawning in the warm shallows, adult kings, steelhead, and brown trout along with an occasional Atlantic salmon are waiting for them in the deeper, colder water . When that happens these actively feeding salmonids are an easy target for anglers along the outside edge of the baitfish concentrations. Alewives slowly move back out into deeper water after spawning, and the king salmon follow them, providing fast fishing action in July and early August. Importantly, weather conditions tend to be much more stable in spring and midsummer than late August and September, when the big blows across the length of the 200 mile long lake keep many anglers off the water. After midAugust, the quality of king salmon fishing in the lake depends mostly on the weather. If it’s windy and rough, you cannot safely and/or comfortably fish the lake. If it’s rainy with lots of runoff, flow in rivers like the Salmon and Oswego rises, attracting spawning kings. I’ve seen major king salmon runs in the Salmon River as early as August 24. When that happened, it was tough to catch a salmon within 6 miles of the mouth of the Salmon River for the next three days. Another factor to consider is boat fishing pressure in late August and September when kings stage in small areas off the mouth of the Salmon River and in and around Oswego Harbor, concentrating fishing boats. Yes, there are lots of kings in that situation, but lots of boats also, definitely not a place for the weak of heart! Bruce with an early season king he boated on 4/30/15 in choppy, but fishable seas. As I finished brushing the fish cleaning table on the stern of my charter boat late one Sunday morning, I noticed two couples walking toward me down the dock. Despite their long faces, they greeted me with a pleasant, “Hi, how did they bite this morning?” “Well, my party boated 4 nice browns in 4 hours in the shelter of the harbor, not great, but not too bad considering a nasty northwest wind kept us from fishing the main lake.”, I replied. As we chatted, I learned the two couples had traveled from New England to Oswego, NY, to fish with one of the charter captains in the marina. They had booked a trip on Sunday afternoon, and another the following Monday morning. Because of the high winds that Sunday afternoon and the forecast of more to come on Monday morning, their captain had cancelled both of their trips. No wonder the long faces. Safety when seas are rough is a primary concern when fishing Lake Ontario. It is up to your captain to judge the weather and make conservative decisions assuring your health and welfare. It is also up to your captain to make every effort to get you out on the water, if the weather permits. The decision to fish or not in rough seas is a delicate balance that always puts safety first. An hour later, when my charter for the next day stopped at the boat to check in, we talked about the weather. Safety was first and foremost on my mind, but I also realized that, 1) they had traveled a long distance to fish, and, 2) weather forecasts are correct only 50% of the time at best. With all this in mind, we decided to meet at the dock at 5:00 AM, check the wind and seas, and make a decision to fish or not. At 4:00 the following Monday morning, I was pleasantly surprised to find the wind had subsided. The VHF radio on my boat relayed the updated marine weather forecast, 10 knot winds until midmorning, then increasing to 10-20 knots with gusts to 30 knots as a front moved in. It was the break we had hoped for. As we planed past the Oswego Harbor light house minutes after 5:00 AM and entered the open lake, we were greeted by gentle 1-foot rollers and an overcast sky, perfect conditions for catching spring king salmon. By 9:00 AM, when we felt the westerly wind freshening, Henry, Frank, and Bill had boated 4 kings and a coho. We pulled the lines and 5 minutes later were back in the shelter of the harbor where we finished the trip fishing brown trout and watching the seas outside the harbor build. The three football browns they boated in the harbor were the icing on the cake. Weather is one of the primary concerns for folks fishing Lake Ontario, and an important reason, if you are booking a charter, to schedule more than a 1-day trip, if possible. May, June and July are normally three of the calmest months of the season on the lake. By midAugust, even though it’s a popular time to fish for salmon, the weather usually starts to get snotty, with an increased chance for a blowoff. If you are traveling to Lake Ontario to fish for brown trout in the spring or king salmon in September, fishing out of a port like Oswego Harbor increases your odds of beating the weather because there is often plenty of good fishing that time of year inside the harbor in the shelter of the breakwalls or in the lee of the east breakwall on westerly winds.. If you schedule more than one day of fishing, there is a good bet that you’ll get to fish.